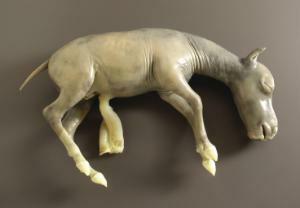 Large formalin preserved horse. Available in pails. Students will benefit from studying a developing fetus and viewing its organs in detail. Examining a fetal horse provides insight into subsequent growth and development of the animal while promoting deeper understanding of parturition. Size will vary depending upon length of gestation period — either small, near term size or large, early term size, but will be 20 inches or longer in length. Packaged separately in a pail or small drum. Note: Substitutions may occur. Call for details. Specimen may be packed in small drums depending on size.